It doesn’t get much cooler than this. The Firstgear Hypertex Mesh II jacket has excellent air flow. The pants aren’t quite as cool if you’re riding behind a fairing however. Both the jacket and pants are very comfortable. The jacket runs true to size; the pants seem a touch short. The jacket zips to pants and the pants have zippers on rear of leg for more comfort when tucked into boots. Protection is thin and is not CE-approved. There are no zipper pulls on pockets. Also, Firstgear has included a windproof liner that adds to versatility. Do female motorcyclists represent one of the fastest growing population segments in the sport? Some industry trade groups think so. But some retailers claim that women don’t seem to respond to the same type of marketing and sales efforts that work for males. 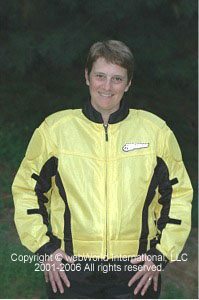 Our hypothesis is that some of the problem may be due to the unique issues involved in designing and fitting motorcycle clothing for women. Until recently, women were considered second-class citizens, and had to make do with “Unisex” sized leftovers that were cobbled together after the men’s clothing lines were developed. Manufacturers obviously see the potential, and they aren’t giving up on this market. We’re starting to see women’s motorcycle clothing that has been designed, styled and fitted for just for women and available in women-specific sizes. FirstGear has created an entire line of women’s motorcycle clothing that includes specialty items like this warm weather riding outfit. FirstGear has been a recognized name in motorcycle apparel for some time, and we applaud them for their focus on the growing demand for women’s motorcycle clothing. 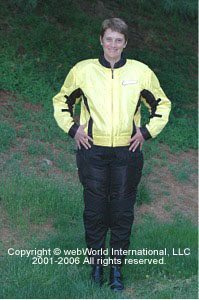 We turned this review over to Lori, our Women’s Motorcycle Clothing reviews editor, for her comments regarding the FirstGear Women’s Hypertex Meshtex jacket and the FirstGear mesh women’s pants. Both are designed for warm to hot weather riding. I was envious of my husband’s FirstGear Hypertex Meshtex mesh jacket and pants ensemble, which has become his favorite outfit for summer riding. 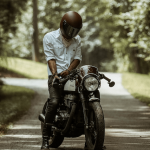 It has only been a couple of years since the the motorcycle clothing manufacturers discovered mesh fabrics and started using them for riding clothes that are suitable for wearing in the hottest weather. Prior to that, women (and men!) were limited to a selection of either lighter weight leather or textile jackets and pants, which typically have very poor ventilation. About the only alternative for riding in the hottest weather is T-shirts and jeans, which in my opinion is an unacceptable solution. Riding in hot weather can be very uncomfortable when you’re wearing leathers. Until the advent of mesh warm weather motorcycle clothing, I was actually more comfortable riding in the middle of winter than in the summer! webBikeWorld reviewed the FirstGear Hypertex Meshtex jacket and pants (first generation) last year. 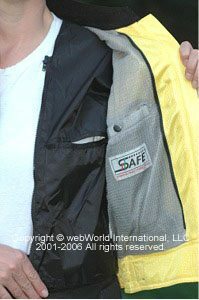 I browsed through that article just to refresh my memory and to compare to FirstGear’s latest offering in their “Version II” jacket and pants for 2004. I’ll say right off that I definitely agree with last year’s review that this jacket and pants combo is about as comfortable as I think you can expect to find in motorcycle clothing. The mesh in the jacket has a silky feel and it’s a tighter weave than on some competitor’s products. The jacket and pants are designed to fit tighter than jeans, but they feel good and are comfortable to wear both on and off the bike. Motorcycle clothing is designed to fit somewhat tighter than street clothes. This helps to keep the armor or padding in place during a fall so that it can do its job, and to prevent bunching in the unfortunate event of a slide. If the clothing is too loose, it also tends to flap around in the breeze during the ride, which can cause buffeting that can be tiring and annoying. If the sleeves are too loose, the buffeting can actually transmit arm movements through the handlebars into the steering as an unwanted input. But if the clothing is too tight, it can make it more difficult to move freely or lean forward, especially when riding a sport bike. I’d say that the FirstGear mesh jacket is a nice, happy medium; snug enough to be correct but has enough flexibility to move with your body in any position. The FirstGear Hypertex Meshtex jacket is available in women’s sizes Small to XXL. FirstGear uses alphabetical (or “Alpha”) sizing for their women’s jackets, which seem to be specifically tailored for a woman’s shape. For more info, see the FirstGear women’s size chart below. I’m 5’8″ and weigh about 135 pounds, and I normally take a size 12 jacket, so I ordered a size large jacket, which in FirstGear sizing translates to a size 12-14. The jacket fits me very well, and it’s just a little bit loose, so based on this experience, I’d say that the FirstGear mesh jackets run very true to their claimed size. FirstGear labels this jacket as their “Hypertex Meshtex II”, and I take it that the “II” means it’s updated from last years’ designs. But when I compared it to last year’s men’s version, I couldn’t really find much of a difference. FirstGear continues to provide the two “hook and loop” tabs on the arms, which can be used to snug up the sleeves to help make sure that the elbow armor stays properly located. This also helps to keep the arms from flapping around in the breeze. The adjustment tabs are long enough to accommodate a wide variety of arm thicknesses; I had to snug mine up about half-way to be effective. I have seen some jackets with these “snug tabs” that don’t provide enough length to work properly for thicker arms, but the FirstGear jacket doesn’t have that problem for me. The jacket also has an adjustable waist that uses two 40mm (about 1-1/2″, all inch sizes approximate) wide tabs on each side that also have “hook and loop” closures. There’s a 25cm (10″) zipper in the inside back of the jacket that allows it to be attached to the pants. I highly recommend using this attachment whenever you’re riding, to help make sure that the pants and jacket don’t separate if you fall off and go sliding down the pavement. I like the bright yellow color on this jacket, and I ordered it specifically because I’m hoping that it will provide more visibility. FirstGear’s website doesn’t seem to have been updated (as of this writing) to include any specifications on the Hypertex Meshtex II clothing, and they still list only a Red/Black and Black/Black combination for women. It would be nice if they offered the jacket in some cool colors, such as shades of purple or blue, but I guess we can’t have everything! The quality of the fabric and the sewing is very good, and double stitches are used on all the seams. There are no loose threads or anything and my feeling is that this is a high-quality article of clothing. FirstGear claims to have over 40 motorcycles owned by their design and product development staff. So it’s always nice to know that riders are behind the designs, because they know what works and what doesn’t. I suggest considering the colored jackets rather than the black-on-black, because the colored jackets have the contrasting black accent strips up the sides and down the arms. That can trick the eye into thinking that the owner is thinner than otherwise might be the case. Let’s face it, when wearing motorcycle clothing, unless you’re a paper-thin model, most of us can use all the help we can get! Also, black isn’t a very noticeable color, and safety should always be a concern. The jacket has two hand pockets that each have a 15cm (about 6″, all inch sizes approximate) opening. I noted that last year’s review of the men’s jacket mentioned that the pockets didn’t have zipper pull extensions. Well, the pockets still don’t have the extensions, so they’re just about impossible to open when wearing gloves. But the upside is that the entire zipper is hidden under the black fabric, which helps give the jacket a more finished look. Each pocket is about 15cm deep and lined with mesh, which is just about big enough for a hand to fit inside, if you care to. I keep my earplugs in one pocket and my cell phone in the other. There’s also a single snap pocket on the left hand side, just inside of the jacket. This pocket has a 13 cm opening and is about 20 cm deep, which is big enough for a small wallet. I usually carry my license, a credit card, some cash and not much more in a small leather wallet that I use when riding. The one feature that is new for this year, and that I suppose justifies the “II” moniker, is the standard windproof nylon zip-in lining. It attaches to the jacket with lightweight zippers on either side of the jacket’s lapels and with a metal snap on the back of the neck. It also attaches inside the sleeves with two metal snaps located at the end of the abbreviated sleeves and which are a bit hard to reach. It’s nice to have a windproof liner, because depending upon the temperature, the jacket sometimes almost flows too much air! It’s so cool and allows so much air to flow through that if the temperature drops below about 75-80 degrees I can get a chill. The liner is very thin and light. It can easily be rolled up into a tight little package and stowed under the motorcycle’s seat if there’s no other room. But when the liner is inserted, it effectively blocks a lot of the wind and adds to the versatility of the jacket. 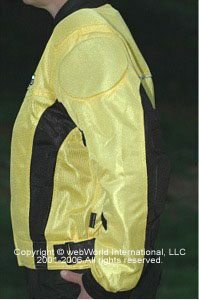 The liner doesn’t have any insulation, so a lightweight vest may be necessary if you’re going to be riding after dark. Also, when you need some insulation in addition to the wind-breaking qualities of the liner. By the way, the liner also has an opening that allows access to the inside breast pocket. The jacket collar is lined with a comfortable fabric that feels like a cross between suede and polar fleece. The collar doesn’t have a button closure in the front and doesn’t really need one. Everything about this jacket is simple and streamlined, which is what makes it comfortable to wear and easy to live with in hot weather. The sleeve cuffs close with a “hook and loop” tab that also allows some adjustability, and there are no zippers on the sleeves, so that’s one less thing to go wrong. The main jacket zipper is nice and big, and it has a “TTL” brand logo on it. The zipper is made from nylon, and this one does have a pull tab extension, making it easy to grab. There’s a short 25 mm-wide flap that acts as a backing for the zipper and helps prevent the nylon liner or whatever you’re wearing underneath from getting caught in the big zipper teeth. We nicked last years’ Hypertex Meshtex jacket because the “armor”, or padding, is very thin. Well, it seems that FirstGear unfortunately hasn’t improved either the padding style and quantity. The EVA (Ethylene Vinyl Acetate) material that’s used for the padding still isn’t CE-approved, and it’s rather thin, but still probably many times better than the alternative of a T-shirt and jeans. The elbow area has a large piece of internal padding that measures about 28cm (11″) long and about 19cm (7-1/2″) wide. The outer portion of the sleeve has three separate little pieces of padding that act more as a decoration than as protection. The back padding is 36 cm long (14″) and about 16 cm wide at its widest point. All the padding is vented, and the back padding is removable, so it might be possible to fit a piece of CE-approved hard-backed armor in place of the original padding, although I haven’t tried to do this. There’s also some internal padding in the shoulder and upper arm area. The jacket also uses some 3M Scotchlite material used in a strip of piping across the back and in the “FirstGear” logo on the front for visibility at night. The combination of the Scotchlite piping and the bright yellow color will hopefully do its job in letting know that I’m on the road! I really like this jacket and also the jacket/pants combination. It’s more comfortable than any other riding outfit I’ve tried, and it does what it’s designed to: provide a reasonably protective outfit for use in the hottest weather. It just has to be better than the T-shirt and jeans alternative. I haven’t tested its ability to protect in a fall, and I still feel more confident wearing a full set of leathers, but if the alternative is not to ride because it’s too hot, then this outfit is well worth it. We see lots of motorcyclists riding in the summertime with virtually no protective riding gear, and there’s really no excuse for that, especially when you can buy this set for about $250.00. Isn’t your body worth at least that much? From “L.S.”: “I wanted to let you know that I really respect your website and the reviews and information that you provide. I regularly check for updates on products, especially women’s clothing. We all know that women have had to convert men’s sizing to fit us for years so thank you for providing extensive information and resources around women’s clothing. I recently purchased the Firstgear Mesh Jacket & Cortech GX air pant based on your review. I researched recommended online resources and went with New Enough and Kneedraggers and had exceptional service with both companies. I love both products and enjoy a very comfortable fit thanks to the reviews.